Upside Down Car Loan - 7 Things You Need To Know! Upside Down Car Loan – 7 Things You Need To Know! If you are looking to trade in your current car to receive the best car loan rates it’s important to know whether you will have negative equity after the trade in. This happens when you turn in your older car for a newer one and the loan is more than what the car is worth. It is also commonly referred to as an upside down car loan. 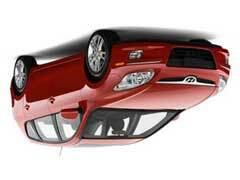 If you are thinking of doing an upside down car loan, here are seven things you need to know. 1. The first is you should consider other alternatives. If your current vehicle is in great shape there is no reason to trade it in for another. When you think about the all the money you could save by not having to make a car payment it makes since not to sign another long term commitment. 2. When trading in your car you will want to minimize the amount of money carried over to the next loan. You can do this by understanding how much you still owe on the trade in vehicle and how much it’s worth. Then, you can bring an additional downpayment to the table to offset some of that difference. 3. When considering an upside down car loan do not buy a new car. New vehicles depreciate by 20% the minute you drive them off the lot. In turn, this means you will have a new loan where you may be paying a substantial amount more than what the car is worth. If that vehicle ever becomes repossessed you could pay through the nose in the deficiency balance. 4. If you do decide to do an upside down car loan, shop around. Often times you can find the best prices through the internet. Online car loans are also convenient as after you receive approval they can send you a blank check, which you would take to the dealership for purchase. 5. Moreover, your local credit union is a great place to receive financing. They help people from all backgrounds and they often have better rates than online or big banks. Further, for people looking for a car loan with bad credit, they might be the best option for you. 6. When shopping for your next vehicle, research your local dealers for any trade in specials. Sometimes they may offer an additional amount for trade ins over their Kelly Blue Book value. This can help as it would lower the amount carried over to the next loan. If you find a dealer that is offering this, make sure to contact them and see what the requirements are as not all vehicles will qualify. 7. Lastly, when signing your new loan make sure you read all of your documents carefully. This will help you see everything from your interest rate to whether there is a prepayment penalty if you pay the loan off early. Additionally, request a car loan amortization schedule as it can help you see how much of each payment goes to principal and interest through the life of the loan.